Audio-Visual Equipment Request – PCC faculty and staff can request AV equipment delivery for classes or special events, or reserve AV equipment for checkout. 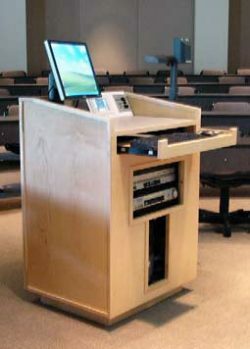 Project Request Form – Deans and Department Chairs can request an equipment, room, or podium upgrade or installation project. Training Resources – Documentation to help you learn about PCC Media Services technology. Classroom Technology – Learn about the equipment and resources that are available from Media Services. Assistive Technology* – AT is a cooperative effort provided by Media Services and Disability Services. PCCTV Services – Do you need media to support and promote your PCC program or service? We also provide video support for live events, as well as lecture capture for faculty and staff. Media Production Request* – For when you need help creating new video or other media resources. Fill out this form to request a project from Media Services, Video Production Unit and other media production staff at PCC. Media Conversion Request* – Do you have a DVD, VHS tape or other media item that needs to be converted for use on the web, or to a different format? Start by completing this form. It will walk you through the necessary steps to get the media converted.